Over the course of their decades-spanning career, the Canadian power trio Rush emerged as one of hard rock’s most highly regarded bands; although typically brushed aside by critics and although rare recipients of mainstream pop radio airplay, the group nonetheless won an impressive and devoted fan following while their virtuoso performance skills solidified their standing as musicians’ musicians. Rush formed in Toronto, Ontario, in the autumn of 1968, and initially comprised guitarist Alex Lifeson (born Alexander Zivojinovich), vocalist/bassist Geddy Lee (born Gary Lee Weinrib), and drummer John Rutsey. In their primary incarnation, the trio drew a heavy influence from Cream, and honed their skills on the Toronto club circuit before issuing their debut single, a rendition of Buddy Holly’s “Not Fade Away,” in 1973. A self-titled LP followed in 1974, at which time Rutsey exited; he was replaced by drummer Neil Peart, who also assumed the role of the band’s primary songwriter, composing the cerebral lyrics (influenced by works of science fiction and fantasy) that gradually became a hallmark of the group’s aesthetic. With Peart firmly ensconced, Rush returned in 1975 with a pair of LPs, Fly by Night and Caress of Steel. Their next effort, 1976′s 2112, proved their breakthrough release: a futuristic concept album based on the writings of Ayn Rand, it fused the elements of the trio’s sound — Lee’s high-pitched vocals, Peart‘s epic-length compositions, and Lifeson’s complex guitar work — into a unified whole. Fans loved it — 2112 was the first in a long line of gold and platinum releases — while critics dismissed it as overblown and pretentious: either way, it established a formula from which the band rarely deviated throughout the duration of their career. A Farewell to Kings followed in 1977 and reached the Top 40 in both the U.S. and Britain. 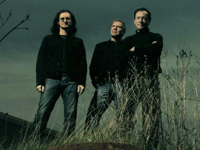 After 1978′s Hemispheres, Rush achieved even greater popularity with 1980′s Permanent Waves, a record marked by Peart’s dramatic shift into shorter, less sprawling compositions; the single “The Spirit of Radio” even became a major hit. With 1981′s Moving Pictures, the trio scored another hit of sorts with “Tom Sawyer,” which garnered heavy exposure on album-oriented radio and became perhaps their best-known song. As the 1980s continued, Rush grew into a phenomenally popular live draw as albums like 1982′s Signals (which generated the smash “New World Man”), 1984′s Grace Under Pressure, and 1985′s Power Windows continued to sell millions of copies.